The primary purpose of these experience reports and the Annual Report of Accidents in North American Mountaineering is to aid in the prevention of accidents. 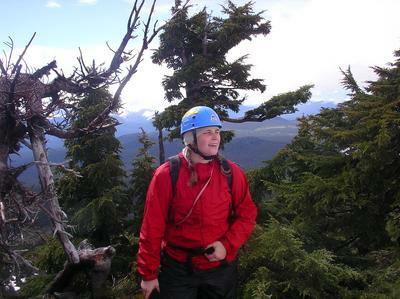 At about 2PM on Saturday afternoon on July 24, 2005, Kate Tinnesand, 23 years old and an Oregon State University graduate student, was making her way along a climber’s trace down an exposed section of the standard South Ridge Route of Three Finger Jack, a peak in the Mount Jefferson Wilderness. She had summitted the Class V "summit block" with two friends and had completed the “Crawl”, both exposed sections of climbing which are normally roped. Unroped and descending below the Crawl, she apparently slipped on the dangerous footing of fine scree over the steeply sloping rock of the exposed climber's trace and fell about 700 feet to the top of the talus slope on the west side of the ridge. Her body was recovered Saturday evening by the Jefferson County Sheriff’s Camp Sherman Hasty Search and Rescue Team and evacuated along the Pacific Crest Trail by Linn County SAR and the Jefferson County Sheriff's Mounted Posse. She was found very near the same place as the body of a young man who fell from the same place on the South Ridge in October 1997. Analysis of Accident: What knowledge and techniques will help prevent future accidents? A slip and fall on exposed steep sloping rock can lead to a fatal slide. Experience leads to concentration and care on exposed Class IV terrain. This Report has been submitted for inclusion in the 2006 edition of Accidents in North American Mountaineering. Source: Robert Speik. Having been on the mountain the day of the accident (our group left "the crawl" area mere minutes before Katie's fall), I've been sobered by how unfortunate all of this has been. It's really put things into perspective: climbing can be dangerous no matter your skill level and objective hazards do exist. We all understand those risks, accept them, and, therefore, reach such lofty places that inspire us. Our bonds with each other and the environment are strengthened by what we learn on the trail and in the mountains. I did not know Katie, but I gather that she had a deep respect for the mountains and was a good friend. It sounds like she was an amazing person. Bless her soul. I saw Katie and her group at the alcove before the final pitch to the summit. I distinctly remember how everyone up there seemed to be having a great time- glorious weather, joking, and laughter. Indeed, it was a beautiful day. At approximately 1530 on Saturday, July, 23rd, Iain, Desiree, and Kate were just leaving the area of The Crawl on Three-Fingered Jack after a successful summit when Kate lost her footing and tumbled down the west side of the mountain. Iain immediately called 911 to report the accident and then called Joy Linn (CMRU In-town Coordinator) with the terrible news. He then directed another climbing group to descend and look for Kate. The Air Life helicopter from Bend lifted four members of Camp Sherman Hasty Team from an improvised heli-spot in the Hoodoo parking lot to the meadows west of the mountain in three lifts; but it was evident after the first pass that Kate had not survived the fall. Joy put the Unit on Stand-by at 1603 and later received permission from Linn County to respond. Bob Freund and Nick Pope (PMR) were both in the area and hiked in toward the mountain to meet Desiree and Iain as they made their way back to their vehicles. As Unit members arrived at the PCT trailhead, it appeared Linn County did not require/desire our assistance so members hiked in a short distance to meet Iain and Desiree as they came out to offer what support they could. They arrived at the trailhead at dusk. Kate was put into a SKED by Camp Sherman Hasty Team members and lowered about 1300 feet down the west scree field to the PCT. From there, she was taken by horse to the trailhead. "Mt. Whitney's East Face Route is quicker!" Wilderness Travel Course Newsletter this is a large PDF file! Mountain calamity on Hood brings safety to the fore! Fall into the Bergschrund on Mt. Hood, rescuers crash!